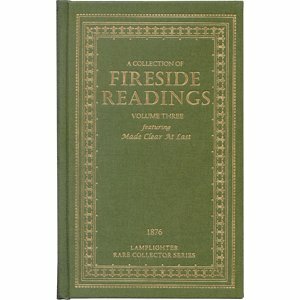 Fireside Readings Volume III is part of the Fireside Collection. Young Fred Mathers is determined to clear his father's good name and pay off the debt he owed before he heroically lost his life. Fred's diligence and hard work earn him the respect of his master as well as the cruel taunting of a jealous co-worker, troublesome Timothy Trump. This fine story demonstrates how crucial it is to trust God through times of painful struggle and emotional turmoil, for in His perfect timing God's purpose will be made clear at last. I highly recommend this story as a family read-aloud; it will instill many priceless truths into the hearts of boys and girls as they seek to do right in the midst of daily pressures and trials.